Railpictures.ca - Marcus W Stevens Photo: It’s hard to imagine this location at the end of Court Street as the old CP station site in Milton. Up until a few years ago the old crumbling concrete unloading ramp sat overgrown in the foreground, The handsome old brick station unfortunately was razed years ago, although the towns original Credit Valley Railroad and hamilton & Northwestern stations still survive, no longer track side or in railway use. Today CP has no customers in town although up to the last decade or so a since torn down industry to the right of me occasionally received boxcar loads. How time changes so much. Here we find rack train 147 hustling past the old station site with freshly overhauled 8001, leading BNSF 5001 and former SOO SD60 6223 on a sunny fall day. | Railpictures.ca – Canadian Railway Photography – photographie ferroviaire Canadienne. Caption: It's hard to imagine this location at the end of Court Street as the old CP station site in Milton. Up until a few years ago the old crumbling concrete unloading ramp sat overgrown in the foreground, The handsome old brick station unfortunately was razed years ago, although the towns original Credit Valley Railroad and hamilton & Northwestern stations still survive, no longer track side or in railway use. Today CP has no customers in town although up to the last decade or so a since torn down industry to the right of me occasionally received boxcar loads. How time changes so much. 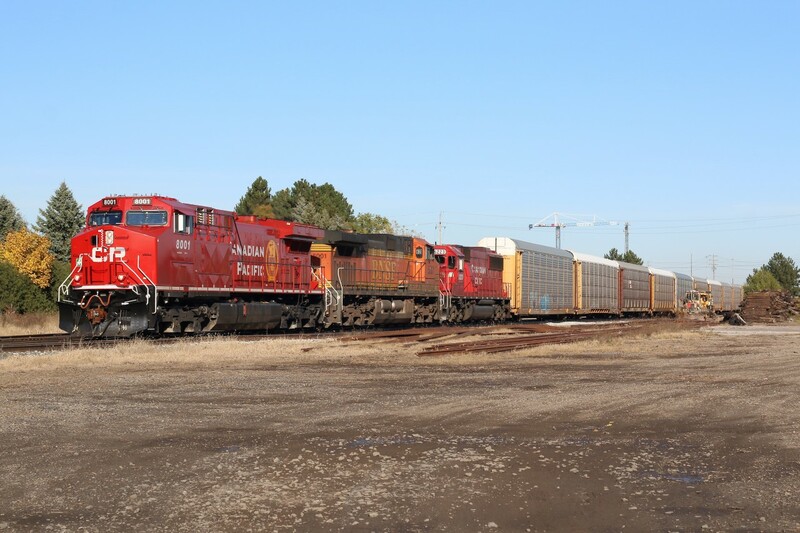 Here we find rack train 147 hustling past the old station site with freshly overhauled 8001, leading BNSF 5001 and former SOO SD60 6223 on a sunny fall day.